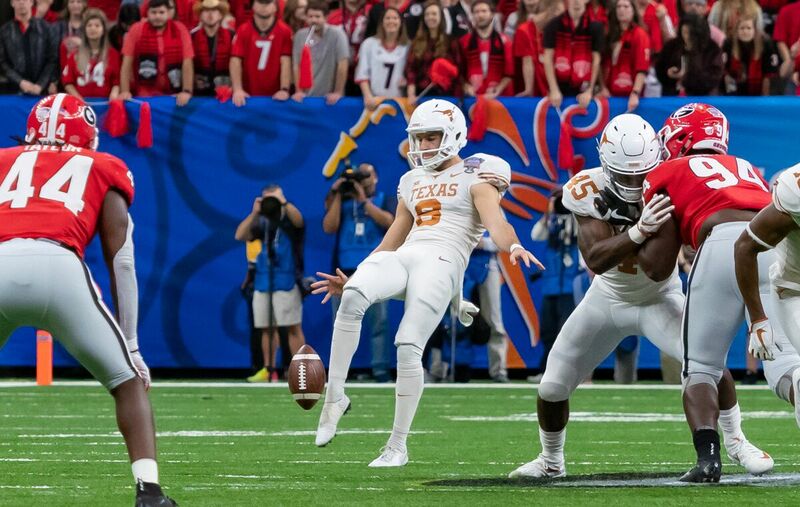 AUSTIN — The Texas punter job was passed from 2017 Ray Guy Award winner and 2018 AP First Team All-Pro Michael Dickson to his cousin Ryan Bujcevski the moment the Longhorns received the latter’s National Letter of Intent in December 2017. Replacing the production from one of the best Longhorn specialists ever would be quite the challenge. 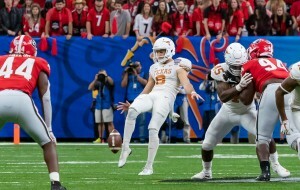 Dickson’s ability to flip the field with booming punts and pin opponents deep with coffin-corner kicks that he kept out of the end zone was a large reason behind many of Texas’ seven 2017 wins. Bujcevski’s first season playing live American football games deserves some amount of praise. For most of the season, his performances were very forgettable or unnoticeable. In the wake of replacing an eventual All-Pro, it was definitely a step back in punting production. However, Bujcevski limited opponent’s returns throughout the 2018 season and made very few catastrophic mistakes. There was never any amount of extended focus on the Texas punter. The punt team was extremely reliable this year. Texas had one punt blocked in 2018 in the second quarter against Tulsa. However, Bujcevski’s average was mediocre. After Dickson’s 47.4 yards per punt ranked him third in the NCAA in 2017, Bujcevski’s 40.3 yards per punt ranked him 79th in punting average in 2018. Even without the big leg, teams rarely returned Bujcevski’s punts. Only one punt had negative gross yardage, and just four of his 63 punts had a gross of less than 20 yards. For the entire season, Bujcevski let just one punt slip past teammates into the end zone for a touchback. He became more comfortable as the season went along, averaging more than 40 gross yards per punt in six of the last seven games. A large majority of his kicks were fair caught or were not returned. Opponent’s average return per Bujcevski punt was 2.2 yards. Texas’ average net over all punts was 37.7 yards per punt. Bujcevski showed some signs of being able to boom the ball like his cousin toward the end of the season. With Dickson, he made a huge jump in average punt yardage between his freshman and sophomore seasons. Dickson added 6.1 more yards per punt on average in his sophomore year, all while showing a greater command on the American game. 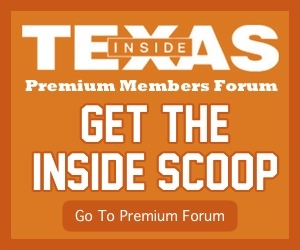 The accuracy and ability to limit opponent’s returns this early in Bujcevski’s Texas is a positive development for head coach Tom Herman and his special teams staffers. After punting was a feature that won games in 2017 (something only a handful of FBS teams have every year), it was not a part in losing games in 2018, rather the beginning of a family tradition.